Come experience the ultimate fishing adventure while relaxing in luxury at Alaska's best fishing lodge. Aug. 3rd, 2014 – Eleven year old Billy O’Malley of Hinsdale, IL. caught the second biggest king salmon ever taken at Kodiak Island Resort today. 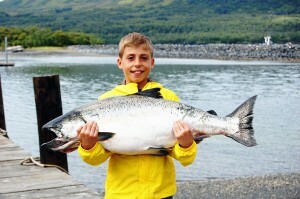 The fish weighed 39 pounds 8 ounces when weighed at the lodge. Billy weighs in at 68 pounds and found this huge king to be a terrific fighter. The big fish made two long runs dumping the reel all the way to the spindle twice. Get battle and great fun for everyone including Billy’s father Bill Uncle Paul and older cousin Nick. I addition to the monster king salmon the party also caught a limit oh halibut and 10 coho salmon in addition to several tanner crabs. The weather was a balmy 72 degrees with clear skies and lots of sunshine. Nothing beats Kodiak Island weather and fishing in August.